Stress and anxiety are common complaints in today’s busy and fast-paced society. As a yoga teacher, I’m often told by my students how relaxed they feel after the breathing techniques we do in yoga class, with students often taking the practice and using it in everyday life in stressful circumstances or to help them to sleep at night. When we are anxious or stressed our body moves into the “fight or flight response”. This is an ancient reaction of our nervous systems to a perceived threat in our environment. One of the first indicators that we are in this response is that our breath becomes quick, shallow and erratic. The breathing technique described below will slow and ease the breath resulting in the nervous system becoming calmer and more relaxed bringing us into a quiet place of peace. Lie on your back with your knees bent and your feet flat on the floor about hip distance apart or sit comfortably in a chair. Place one or both hands on your abdomen and close your eyes if that feels comfortable. Allow the breath to flow gently in and out through your nose and initially just observe your breath. Notice how the breath feels without judgement. Is it tense, shallow, fast, uneven? Simply bringing your awareness to your breath can help it to become more relaxed. Gradually focus on making your breath smoother and more relaxed. Try to let each inhalation and exhalation have its full length. Once your breath feels more comfortable, begin to feel the movement of the abdomen under your hands. 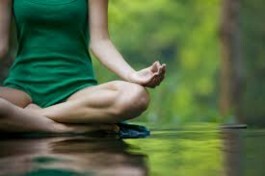 Feel the abdomen rise and expand gently with every in-breath and feel it gently fall and relax with every out-breath. In a relaxed and relatively effortless way, begin to gently exaggerate the movement of the abdomen underneath your hands with every slow relaxed breath. Continue breathing in this way for 5 to 10 minutes or for as long as it takes to feel more relaxed and less anxious. As you become more comfortable with this technique over time, gradually increase the length of your exhalation until it is as twice as long as your inhalation. For example breathe in for a count of 4 and breathe out for a count of 8. This 1:2 ratio of breathing can also help reduce insomnia.